Vulgar Latin or Sermo Vulgaris ("common speech"), also Colloquial Latin, or Common Romance (particularly in the late stage), was a range of non-standard sociolects of Latin spoken in the Mediterranean region during and after the classical period of the Roman Empire. It is distinct from Classical Latin, the standard and literary version of the language. Compared to Classical Latin, written documentation of Vulgar Latin appears less standardized. 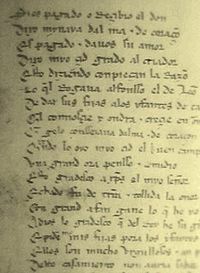 Works written in Latin during classical times and the earlier Middle Ages used prescribed Classical Latin rather than Vulgar Latin, with very few exceptions (most notably sections of Gaius Petronius' Satyricon), thus Vulgar Latin had no official orthography of its own. By its nature, Vulgar Latin varied greatly by region and by time period, though several major divisions can be seen. Vulgar Latin dialects began to significantly diverge from Classical Latin by the third century during the classical period of the Roman Empire. Nevertheless, throughout the sixth century, the most widely spoken dialects were still similar to and mostly mutually intelligible with Classical Latin. In terms of regional differences for the whole Latin period, "we can only glimpse a tiny amount of divergence with the actual written data. In texts of all kinds, literary, technical, and all others, the written Latin of the first five or six centuries A.D. looks as if it were territorially homogeneous, even in its 'vulgar' register. It is only in the later texts, of the seventh and eighth centuries, that we are able to see in the texts geographical differences that seem to be the precursors of similar differences in the subsequent Romance languages." Thus the Latin of classical antiquity changed from being a "living natural mother tongue" to being a language foreign to all, which could not even be used or understood even by Romance-speakers except as a result of deliberate and systematic study. If a date is wanted "we could say Latin 'died' in the first part of the eighth century", and after a long period 650–800 A.D. of rapidly accelerating changes. Even after the end of Classical Latin, people had no other names for the languages they spoke than Latin, lingua romana, or lingua romana rustica (to distinguish it from formal Latin) for 200–300 years. Modern people call these languages proto-Romance. The Romance languages, such as French, Italian, Portuguese, Romanian, and Spanish all evolved from Vulgar Latin and not from Classical Latin. Although they had become more dissimilar over time, Classical Latin and Vulgar Latin were still viewed as the same language.